Pillboxie is new application (app) that offers a simple way to remember to take your medications. The design is clean and user friendly, something I’ve found lacking in a lot of otherwise useful apps. Jared Sinclair, RN, developed Pillboxie. Sinclair seems to genuinely care about people and is very open to hearing feedback for how to improve the app. In a nutshell, Pillboxie allows users to enter their medications, and select the shape and color of the pill. Users then drag the pills into a virtual pillbox for the time of day when the medication needs to be taken. A medication can be scheduled for multiple times each day. The app then notifies you when it is time to take your meds. You do not need internet access for the notifications to work, which is great for iPod Touch users. One drawback is that you cannot currently set a medication for once a month, or some other irregular time frame. Sinclair recently explained the reason in a blog post and said he is trying to work out a solution. Other improvements that have been requested include: more options for pill shapes and colors and icons for medications that are not pills, like injections and creams. I paid 99 cents for the app, in a sale for early adopters. The current price is $1.99. I have one free download up for grabs. To enter for a chance to win the free download, write a comment below about why this application would be helpful to you. A winner will be randomly chosen and contacted by the butyoudontlooksick.com staff and announced by March 5th. 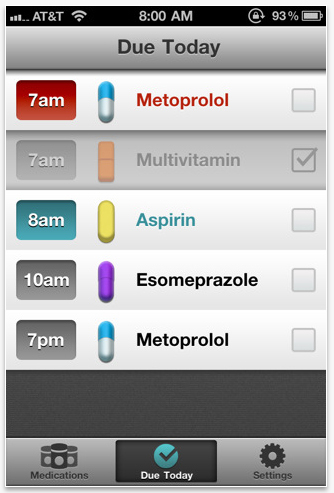 This app would help me remember my medications. My sister-in-law had a watch that could be set for multiple times throughout the day for her to take her pills. They used tiny ziplock bags and labels printed on the computer to lay out her pills for a month at a time. Alarm goes off, she’d take the next bag of pills. It works better for someone who doesn’t always have their phone on them. Still, it would be nice to have some way of recording when you took a prn med so you know when you can take it again. I’m usually pretty good at remembering, but ge confused on really bad days. This sounds like a fairly genius idea to me. Over the past 10 years I’ve mastered the art of taking pills every 4 hours, and it’s simply habit to take my pillbox with me. I’m going to forward this onto my parents who have iPhones. Great article, Kelly! I won a free download of this app from a different website and I must say I don’t care for it. It has no option for meds that are taken as needed like pain pills and since my sleep schedule is so screwed up, it would be nice to be able to turn off the alarm for when I’m sleeping. But I’d an alarm is set, it goes off and won’t stop until you turn it off. I absolutely love the idea behind it but I think it needs some work. Carly, thank you for taking the initiative to email the programmer and ask. Why didn’t I think of doing that? (gonna blame it on fibrofog) And because you contacted him, now he knows he has a market for other platforms and that could motivate him to create other versions. What a great idea! So much easier than those plastic pillboxes… you can put all the medication you want in those things, but if you don’t remember to take them at the right time, that box iis pretty useless. I’d love to try this app – I take quite a few meds throughout the day, and my phone is practically connected to the end of my arm at all times. Sounds great! I take many meds, most once a day and a few twice a day. I can never remember which ones to take in the am and which in the pm. This would help me keep it straight, for sure! For people who don’t have the i-whatever, try this: https://www.pillphone.com/PillLogin.htm. It costs a bit more, but can be worth it. Great, can’t wait til next month when I can get an Ipod creature – I only have a nano right now. This would be a must for me as when I forget to take my tablets my body soon lets me know!! And since I’m never without my phone it’s an ideal way to never forget again. I’m already on my third type of pill box as the first got too small for all my meds and I knocked the second one over and spayed every last tablet all over my kitchen floor!! I’m still finding the odd tablet hidden away months later. I have multiple autoimmune diseases Including RA and lupus. The medications I take on a daily basis are mind boggling to an average person. I use up most of my “spoons” just sorting and figuring out my meds! Add in pain meds and fibro fog and I’m doing good to know what day it is. This app sounds so perfect for me! And when my hubby says “did you take your pills?” You could save a marriage! My usual answer is “what pills?” And it drives him crazy! HaHa thanks for telling us about this and offering a chance to win It! I don’t always carry my iPod touch around with me everywhere I go, but I’m getting the iPhone in a couple of days and that would work for me! Nice one. I only take a few meds now: the usual suspects–reflux, aspirin, statin, vitamins, etc., but when I had cancer 31 years ago, then Guillian Barre 21 years ago, there were a bunch. Plus I helped old Pop with his after his stroke. And in a few years, there’ll be more, no doubt. Thanks for the tip! Thanks for website, I love it! Hmm… I use the alarms on my Android smartphone. The number of alarms I can set is effectively unlimited, each can be given the appropriate drug name, if necessary, and the dose, for the forgetful. No need for an app. This is great! I thought I was going to have to create a spreadsheet for my meds! Can this be used on a laptop ? I sometimes have problems remembering if I have taken medication or not, since I take it straight out of the bottle it is in. This can be a problem when taking my sleeping pills, since if I take another dose, then I sleep till 10 AM. I wake up often during the night. Ditto on the vote for an Android version. I have such bad ADD that if I have to stagger pills to avoid food and such, I end up not taking them at all. I’d love to have something to help me remember other than setting fourteen different clock alarms! Do they make this app for the Android format? This would be a great addition for my husband’s new smartphone as he takes MANY medications multiple times per day.